Find out about the different tags used to identify inventorial equipment. Learn how to request duplicate equipment tags, how to apply the tags, and what to do with the Asset Locator form. All inventorial equipment at UCSD, no matter who has title to it, has an identification tag affixed to it. Printed on the tag is a barcode, a brief description of the equipment, and the equipment's UCID number. First pair of digits indicates the calendar year the equipment was acquired. 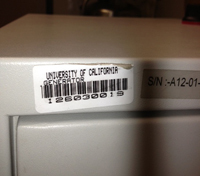 Second pair of digits identifies the campus that originally acquired the equipment. Last five digits designate the sequential placement of the equipment in CAMS. If the government has title to the inventorial equipment, the equipment will also have a government tag. This tag looks the same as the UCID tag, but has "GOVT PROPERTY" printed in place of the equipment description. If you purchase inventorial equipment through Marketplace or UCSD Bookstore, Equipment Management is notified automatically. The information is entered into CAMS, a UCID number is assigned to the equipment, and tags are issued to your department via campus mail, with an Asset Locator Report. If you acquire the inventorial equipment via loan or transfer, you must complete an EIMR (PDF). Follow the instructions on How to Handle Equipment Acquired as a Loan or How to Handle Equipment Acquired as a Transfer. Verify that the information on the Asset Locator is correct. It is the department's responsibility to update the CAMS record with additional information such as actual location, serial number, PI/custodian, etc. Affix the tags to the front surface of the equipment so they can easily be seen. Email Equipment Management with the Subject of Request UCID Tags. 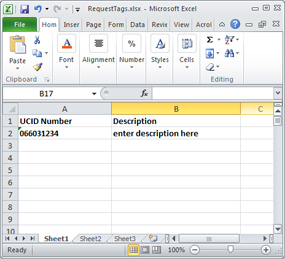 Attach a simple Excel spreadsheet with two columns: the UCID number and the description. Download an example spreadsheet here. In the body of the email, indicate the name and mailcode of the person who should receive the tags.